The end of an era has come to the Smithsonian Libraries and a new one begins! The current model of a library, with a physical location, books and journals on the shelves and a librarian to manage it all is so 2011. 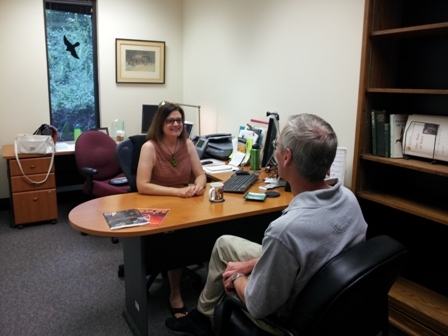 A hip, new model of a ‘ librarian-as-reference-resource-person-embedded-in-research-department’ has come for the National Zoological Park/Smithsonian Conservation Biology Institute in 2012! Background: Over the years, the library at NZP has been located in various places on the Zoo grounds, even in the currently unoccupied Holt House, finally ending up in the Education Building (now called the Visitor Center). With the expansion of NZP and Friends of the National Zoo (FONZ) staff and programs, but few additional building structures, the space occupied by the library became sought after. Years of discussions, meetings, memoranda, phone calls, and emails between SIL librarians and NZP administrative staff addressing downsizing the library space ensued. 2010-2012: In 2010 a SurveyMonkey survey was created to gauge the needs, interests and expectations of library service for all NZP staff. Based on the responses it was clear that desktop electronic access & delivery was most popular for scientists to accomplish their research, not so much going to library shelves that were located some distance away from them. So the decision was made to downsize the NZP library collection: send much of the print material to the SIL Research Annex (a.k.a., PennSIL) but move some of the most important items to shelves in the Science building on Research Hill, the non-public research area of the Zoo. The advantage to this plan was that the librarian and material would be exactly where the research community was instead of in some distant building. In 2011 shelving space was calculated, collections were reviewed and processed for duplication & withdrawal and rooms in the Science building were measured. Unfortunately there was still not enough space available for this much smaller portion of the collection. The absolute final determination was made in early 2012: most of the print material would move to PennSIL, some veterinary-related print journals would go to the small separate library collection in NZP’s Dept. of Pathology office area, and some material would be transferred to the main Natural History library. The biggest change was that the NZP librarian would be housed in an office in the Science building, with only a desktop workstation and telephone, and become a library ‘consultant’ for the research staff. So now the librarian is embedded with the core constituency but no longer surrounded by a print collection. Previous Post Digitization Dispatch: A Rose By Any Other Name…Still Has an Historically Accurate Rendering as Accessory! The photos seem to be missing, Polly. I’m afraid I don’t find this as exciting as you do. Watching the books go away in the slide show was depressing. Yes, it was kind of sad to move all that material. But it was not going away, just to new homes within the Smithsonian Libraries. 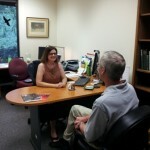 The books are still ‘findable’ for SI researchers, and the world for that matter, on our online catalog http://siris-libraries.si.edu. We are making these changes to better serve our researchers with the up-to-date information they need – much of which is available electronically. For better or worse, this is the trend for academic libraries, especially in the sciences. We will continue to have the best of both for a long while. We have the books and we have the librarians. I’ll bookmark your blog and check again here frequently. I’m quite certain I’ll learn many new stuff right here!